I've been suffering from a bad cold since last weekend. Thursday after work was the first time I felt reasonable to run, and that was a 3 miler on the treadmill which I survived, but didn't enjoy. 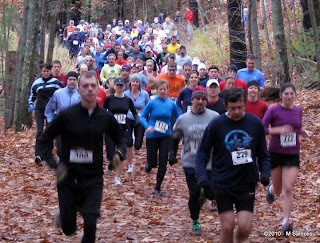 The Jack London 10K is a trail run up in Nashua NH's Mine Falls Park, my old stomping grounds from when I lived up there. Cathy organized a group of folks to run this, including Bob and Geri, Dani, Ryan, and Mike, so I really wanted to participate regardless of how I felt. I figured it's only 10K, I can survive that, right? It was fairly cold in the morning when Monica and I arrived at the parking area, maybe 42 degrees. I was wearing tights and a long sleeve, along with hat and gloves, since I didn't want to get chilled in my current health state. 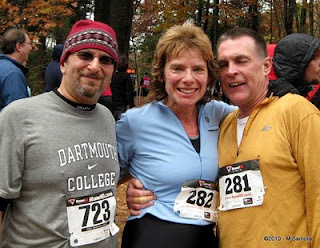 We found Bob and Geri right away, and headed over to register and meet up with the other runners. I saw my friends Reji and Chrissy who were also running the race, and lots of fit people in lycra. We milled about a bit, gathering our little posse until about 20 minutes before the start when we took off our outer layers and went for a warm up run. I could tell it wasn't going to be a great day for me. We lined up in the corral and the starting buzzer went off. Ryan was up near the front, Bob ran away quickly, and Cathy stayed next to me for the first 1/3 of a mile before she pulled ahead. I could run without coughing, but I could feel my legs already, not a great sign. The first loop around the pond starts on fire road, before dropping to a single track on the return side. 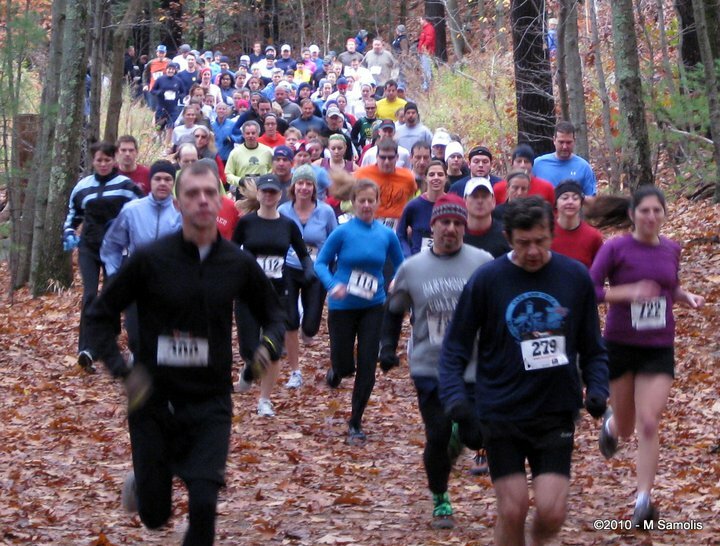 People fell in line and ran at the pace of whoever was in front of them, passing occasionally at the few wide spots on the trail. I kept up a good pace and locked in behind a girl in a tie-died t-shirt who would remain just in front of me for most of the race. We came out to the road back by the start line, waved to Monica who was taking photos, and headed up towards the 2 mile marker down by the river. Cathy had taken us on what was supposed to be a dry run two weeks ago but the race course was much simpler and had less single track than what we practiced on. Along the river some more, then under the highway. For some reason, the pavement under the highway bridge made my legs feel like lead. There was a water station there and as I grabbed a cup the woman said "Dave?" It as Early Bird from VFTT, yet another connection. Then back on the single track next to the highway, where at around half way Dani came past me. I really didn't have anything in the tank to try to keep up so I just tried to keep her in sight. During this stretch I was passed by 3-4 people each mile, a little depressing but it was fine with me, based on how I was feeling. Back to the water station and now I knew there was around 2 miles to go. Too early to kick, too late to care. Mike passed me, then Chrissy right before the last loop into the woods. I knew what was coming so I bidded my time. There's one hill, maybe 20-25' of loose gravel and I managed to catch up to Chrissy at the top, just before we made the turn for home. I could see the small crowd and heard them cheering as we pushed with whatever we had left for the finish. 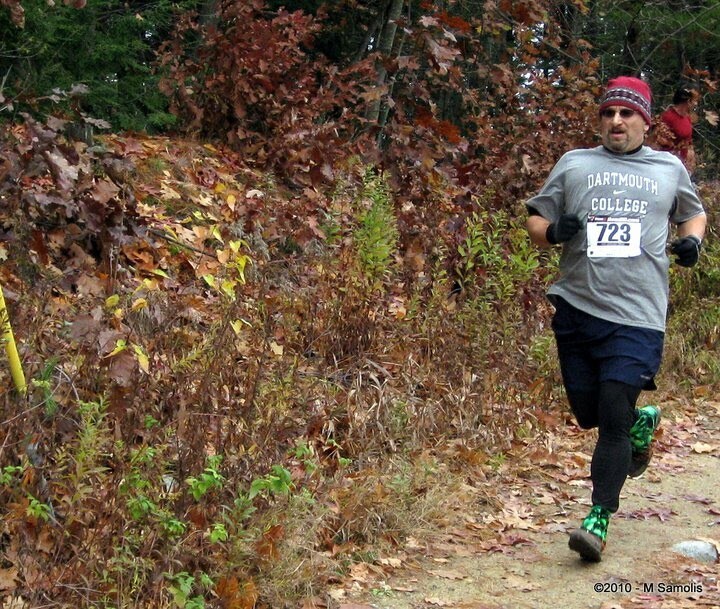 My time was 52:15, which was far better than I had any right to expect. Immediately upon finishing I went into a 15 minute coughing jag that left me feeling drained more than the run. The human body is a curious instrument. Everyone did exceptionally well. Ryan came in 11th overall; Bob won his age group, Reji, Chrissy, Dani, and Cathy all finished in the top 3 in their age groups. Geri ran in her first race ever and did great! And Monica and Liza took some fantastic photos of the event. A great time had by all, one I want to try again when I'm healthy and can enjoy it a bit more.